Snap a strawberry inspired photo while at a Victorian Strawberry Pick Your own farm. The top 10 most inspiring strawberry picking images, as deemed by the judges, will be awarded on the 1st May 2019. Entries need to be posted on Instagram between Monday 18th February 2019 and April 30th 2019. Winners will be contacted via DM and the Victorian Strawberry hamper will be sent to you via the post. This is a game of skill and chance plays no part in determining the winners. Instagram stories will not be judged. Any cost associated with entering is the entrant’s responsibility. Should the Promoter be unable to make contact with any of the chosen winners within forty-eight (48) hours after selection, the winner will be deemed to have forfeited the prize. 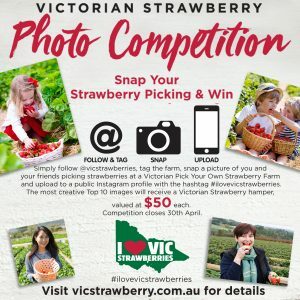 By tagging @vicstrawberries, you give right for Victorian Strawberries to repost your image. Image will be reposted with credit to the photographer. The promoter is Market Maker PR. ABN: 82 532 767 601. This competition is in no way sponsored, endorsed, administered by or associated with Instagram.